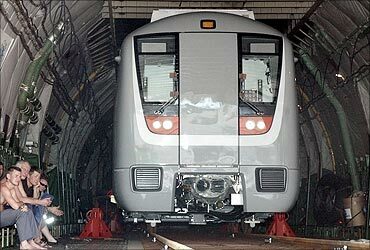 Rediff.com » Business » Will Delhi Metro turn into a white elephant? Will Delhi Metro turn into a white elephant? The first week of October proved a classic example of Delhi Metro Rail Corporation's (DMRC's) hits and misses. A crucial link to Jawaharlal Nehru Stadium was inaugurated barely hours before the start of the inauguration ceremony of the XIX Commonwealth Games on October 3. But the equally vital Reliance Infrastructure-built airport express line missed its pre-games opening after failing a safety inspection. That will have proved a major setback for DMRC boss Elattuvalapil Sreedharan, 78, who has worked hard to keep the prestigious project's construction schedule on track. He has been largely successful on that score. Phase-I had initially been proposed to be built over 10 years from 1995, but construction work commenced only in October 1998. Sreedharan then put in place stringent guidelines and fast-tracked decision-making to complete the 65-km network within a revised seven years and nine months. A dozen years later, DMRC has constructed 190 km (not all of it commissioned) in record time. "What is distinctive of Sreedharan is his attention to detail. He is meticulous when it comes to quality," says R Sivadasan, a former member of the Railway Board. 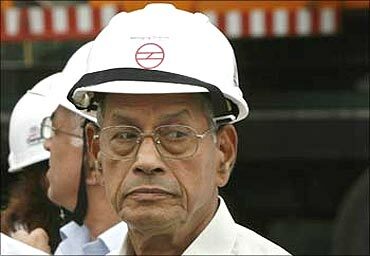 Image: Delhi Metro Rail Corporation (DMRC) Managing Director Elattuvalapil Sreedharan. The project has not done as well on cost. In September 1996, the government had approved the development of 55.30 km under Phase-I at a cost of Rs 4,859.74 crore (Rs 48.59 billion). The estimates were revised upwards to Rs 10,571 crore (Rs 105.71 billion) in September 2005. The per-km cost of construction increased in the interim by around 85 per cent to Rs 162.63 crore (Rs 1.62 billion). This is because the network was increased by 10 km and the initial cost projection was made at 1996 prices. Phase-II, however, saw no such cost escalations. Under this phase, the network was proposed to be extended by 54.6 km at a cost of Rs 8,676 crore (Rs 86.76 billion) and completed in five years. And though the route length was later more than doubled, the 124.63 km under Phase-II will be commissioned largely on schedule. 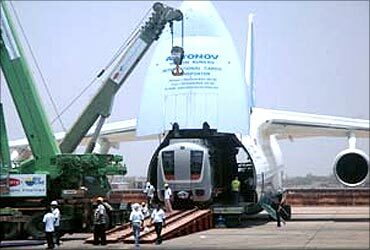 Image: A rail carriage is loaded into an Antonov 124 cargo aircraft. There have been no cost over-runs and the entire project has been developed at a cost of Rs 20,000 crore (Rs 200 billion). Ticket prices have not risen substantially, either. When Delhi Metro started operations, fares ranged between Rs 6 and Rs 22. They were revised upwards by 25-42 per cent last November. The minimum fare is now Rs 8 and maximum is Rs 30. Delhi metro has the lowest fare structure in the world, apart from Kolkata metro. 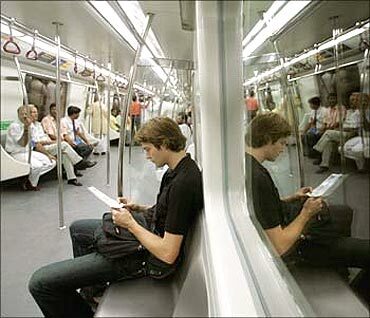 However, the real problem with the Delhi metro is ridership. When consultants RITES submitted a detailed project report on Phase-I in 1995, ridership numbers had been pegged at 3.19 million passenger trips a day. Image: Prime Minister Manmohan Singh during the inauguration of the Delhi metro rail line. In a subsequent report in 2003, ridership projection on completion of Phase-I in 2005 was brought down to 2.26 million. In December of that year, DMRC further reduced the figure to 1.50 million. The actual ridership at the time was a mere 0.4 million. Indian Institute of Technology-Delhi Volvo Research Professor Dinesh Mohan says: "Even at the end of 2007 - over a year after DMRC commissioned Phase-I of the network - ridership was around 0.6 million a day, or less than 20 per cent of the projected capacity." Today, DMRC runs 2,300 trips on its 153-km network, with an average daily ridership of 1.4 million. Even after the remaining segments on Phase-II are commissioned, ridership is not expected to go beyond 2.0 million, which is barely 60 per cent of the original traffic projections for Phase-I. 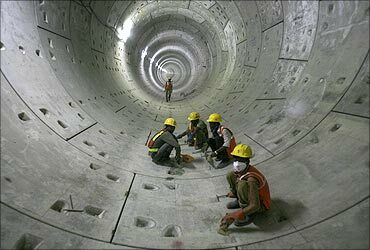 Image: Delhi Metro Rail Corporation employees work inside a tunnel on the phase II stretch. In its review of Phase-I, the Comptroller & Auditor General of India stated: "The fact that transport modelling for ridership was not carried out accurately by RITES was accepted by (DMRC) as well as the ministry of urban development before the empowered group of secretaries in 2005." Integration is vital if Delhi metro is to prove a viable rapid transit option rather than an expensive white elephant. According to a data with Delhi Integrated Multi-Modal Transport System in 2007-08, overall daily trips in Delhi were 14.46 million. Of this, 41.5 per cent (6 million) trips were made by bus and a mere 4.1 per cent (0.60 million) made on the metro. Metro ridership is expected to increase to 3.38 million by 2021. There does, however, appear to have been some improvement as the Delhi metro network has expanded, particularly to neighbouring Noida and Gurgaon. According to a study of commuting modes in the National Capital Territory (or, Delhi and its suburbs), carried out by RITES, MVA Asia and Teri in April 2010, motorised transport accounts for 11.7 million trips daily. Another 11.4 million are non-motorised trips. Metro ridership, at the current daily average of 1.40 million, therefore, accounts for 11.97 per cent of motorised commutes. The NCT has a total population of around 17 million. The real concern, however, is in the area of finances. Of the total Rs 30,571 crore (Rs 305.71 billion) required to develop Phase-I & II of Delhi metro, Japan International Cooperation Agency (Jica) loaned it Rs 16,121 crore (Rs 161.21 billion). That includes Rs 6,434 crore (Rs 64.34 billion) for Phase-I, out of the total requirement of Rs 10,571 crore (Rs 105.71 billion). The interest on the loan is 1.30-2.30 per cent a year. For Phase-II, the agency extended a soft loan of Rs 9,687 crore (Rs 96.87 billion) at an interest rate of 1.20-1.40 per cent a year. The loan payback period for both phases is 30 years, with a moratorium of 10 years. DMRC can pay back the loan for Phase-I by 2035 and for Phase-II by 2040. Starting 2007, DMRC has started paying interest on the Jica loans for both phases, totalling Rs 471.73 crore (Rs 4.71 billion) so far. It has also repaid Rs 95.83 crore (Rs 958.3 million) of the principal for Phase-I. However, after opening the entire Phase-II, DMRC's interest and principal repayments together will be in the range of Rs 500-600 crore (Rs 5-6 billion) a year. 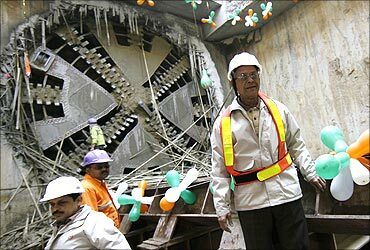 Image: Delhi Metro Rail Corporation (DMRC) Managing Director E Sreedharan. Though DMRC's operational revenues are projected to touch Rs 390 crore (Rs 3.9 billion) in 2009-10, over 25 per cent more than in 2008-09, its operational profit is set to decline by nearly 60 per cent in the current financial year. The corporation estimates it earned Rs 40 crore (Rs 400 million) in operational profits in 2009-10, against the Rs 92 crore (Rs 920 million) profit it made in the previous fiscal. 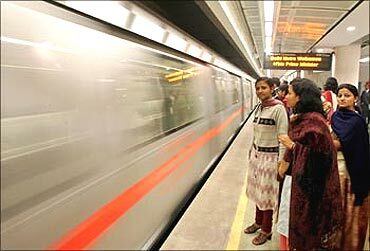 Between 2006-07 and 2008-09, the Delhi metro's operational costs have increased by nearly 80 per cent. DMRC forked out Rs 213 crore (Rs 2.13 billion) in 2008-09 in operational expenses, against Rs 128.76 crore (Rs 1.28 billion) in 2006-07. That figure is expected to touch Rs 987 crore (Rs 9.87 billion) in 2010-11. Clearly, as far as finances go, Delhi metro is hurtling into a tunnel without light at the end of it. 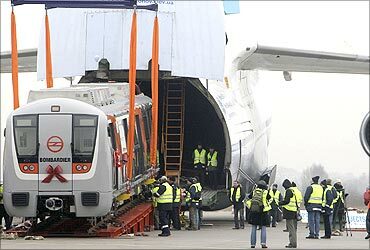 Image: An Antonov cargo aircraft carrying a new metro rail carriage.